With a similar “E-Mail Merge” feature in Microsoft Office Publisher, you can send your personalized publications as designer’s HTML-messages through Outlook as well. All these issues can be avoided if you just have a possibility to use Mail Merge with PDF attachments, i.e. attach your merged message as an individual PDF file – and our extension for Word, Publisher and Outlook, the Mail Merge Toolkit add-in, provides such selection for Microsoft Office 2010 and Microsoft Office 2013 (where converting to PDF files is supported). If you send your messages from Mail Merge in PDF attachments, all your recipients get personalized PDF-files with your text and all images, looking exactly like you designed your document or publication. If you send your mail as PDF files, your recipients may even edit such messages with their PDF-editors. You will be also offered to type your short message text in a separate dialogue window – so that your merged messages with PDF attachments are not empty, and contain personal salutations to all your recipients in the message body as well. Using this efficient feature, you can send personalized orders and invoices in PDF format within a single mailing: just design your document or publication, add fields from your data base to your message – and Mail Merge Toolkit will generate and send messages with individual nice-looking PDF attachments to your customers! NOTE! The special offer is available now – Get life-time license of Mail Merge Toolkit with 10% discount! 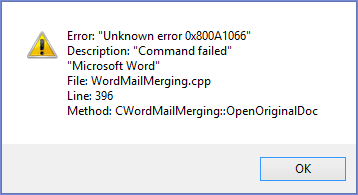 When trying to start the mail merge i get this error. I have tried to re install the program, but nothing changes. I have tried to repair Mail Merge Toolkit, and it tells me the program is not where it used to be, but does not even show the zip folder. Can you please help? This is quite urgent. Additional troubleshooting is required to resolve this issue. Hello Giacomo, thank you for your question. 2. 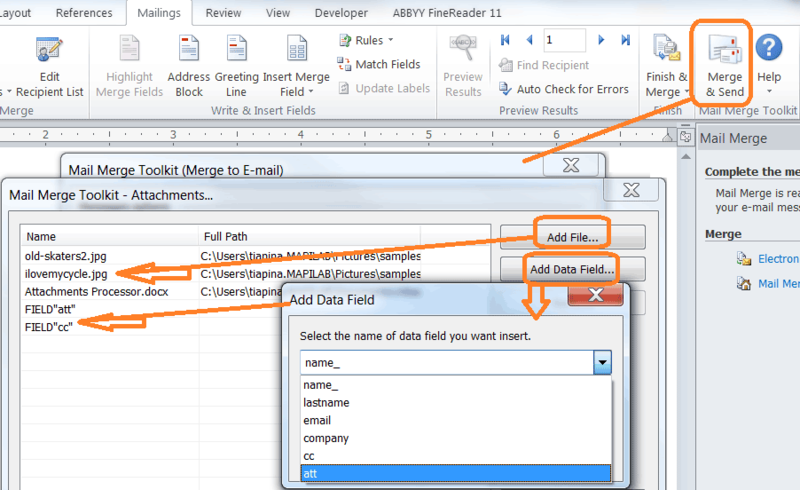 Make sure your e-mail data field is selected correctly in the “To” field of the add-in settings – that data base field should contain recipients’ data with the e-mail address. 3. If you use an Excel file as data source – please close it before merging messages: if it is opened for editing, the system is unable to access data. II. This error message may state the program fails to launch its Outlook component – either due to technical issues with Microsoft Office Outlook, or because the add-in is disabled in Outlook. Could you please test if the regular “Electronic Mail” or “Finish&Merge” Mail Merge options work in your system without issues and send messages to/via Outlook ? a) Launch Outlook before you start mailing from Word. c) If it is inactive, or is not listed as disabled or inactive – remove the tick from its check box in Outlook COM Add-Ins, click OK, then point back – and put the checkmark, then hit OK. This step runs specific troubleshooting – so please do not ignore it. 2. Press Win+E to summon a File Explorer window. 3. Click the Address box to select whatever name appears there. 4. Press the Delete key to clear the Address box. Or, if you start typing AppData, you see hints appear below your typing. These hints help to direct you and confirm that you’re on the right track. Eventually, you see the Templates folder. 6. Right-click on the Normal.dotm file. The file might show only the first part of the name, Normal. 7. Choose the Rename command from the shortcut menu. 8. Edit the name to Normal-old.dotm or Normal-old. If you can see the dotm part of the name, don’t change it. 9. Press Enter to lock in the new name. Keep the File Explorer window open. You don’t need to do anything in Word, though you may notice that any problems you have related to the old Normal template are gone. IV. If the issue reoccurs – please enable maximum logging level (at the General tab), recreate it – and provide us those logs. I am encountering an issue where Mail Merge is not allowing to attach PDF’s when sending. It is saying that it is a versioning issue, however the key is correct and version is proper. I am attaching a screenshot of the error message. Dear Mr. Daniel De La Garza, thank you for your question. Hi, I needing software to create a simple mail merge and add a single attachment to several hundred email addresses. I am struggling to simply add text to document, which is pasted to the email and then add a single attachment. The path I am travelling involves – saving the word doc and having this word doc added an attachment together with the targeted attachment file. In other words two attachments. Can your software help with this task. The formats in the first group will convert the Word document into a personalized email message. The difference between the two is that HTML, Filtered will allow you to keep some Word formatting, including various images and forms, whilst Plain Text will not. The second group comprises the formats which will convert your document to a personalized attachment in a message with empty body, allowing you to populate that body at the next step if necessary. The HTML, RTF and PDF are competing formats, all of which will allow you to keep the Word formatting, unlike Plain Text. Please select HTML, Filtered format if no document conversion during the merge is intended. Hi I’m at the Merge & Send step of the process but my files will not send because the files cannot be located. I’ve tested the file path as described previously in the comments and the correct file appears when copying and pasting the name in to the run bar but when I use the Merge&Send button I get an error saying the attachment can not be found for one email, then the process completes and all 11 recipients have been skipped. Can you help me? Hello Lauren, thank you for your question. Yes, I believe we can help you with it – this part of the task can be troubleshooted on our level. 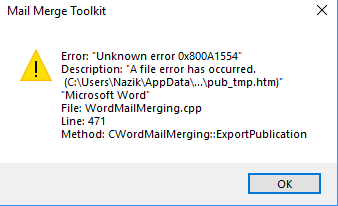 While sending e-mails with Word/Outlook, there is an error at several e-mail addresses and the Toolkit does not send them. Its always the same addresses, but they are correct. I am using Word/Outlook 2010 on Windows 10 with Toolit 2.9 or 2.12.3 (tried them both). Hello Eckart, thank you for your question. Please check your add-in settings: your “An” (To) field may be empty, and this parameter is really incorrect. Please click on the down-pointing arrow and select your data source field containing e-mail addresses. In the folder, please go to: [\MAPILab Ltd\Mail Merge Toolkit\] and subfolders – and locate the .log files. Is there a way to create a locked .pdf that gets attached? I can get it to merge and send as a .pdf attachment; I just need the .pdf to be locked. I can’t figure out how to make that happen. Thanks! Since Mail Merge Toolkit is using the standard Word capability to save the documents to .PDF format upon conversion – advanced features of locking down the resulting .PDF files for editing are not supported, unfortunately. Dear Ahmed, thank you for your question. 1. If you use “PDF Attachment” format, please keep “Use doc. name as att. name” – and if that works, please check your data fields selected for file renaming (they should not be empty or contain punctuation marks). 2. Could you please test if the regular Mail Merge works with the same document and data source ? I am getting an error like invalid pointer . I cant understand how to solve that error.Kindly help me to resolve the error. I am attaching an image regarding the error . Hello Deepika, thank you for contacting us. 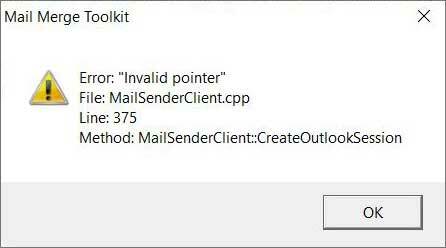 The “Invalid Pointer” error message states the program fails to launch its Outlook component – either due to technical issues with Microsoft Office Outlook, or because the add-in is disabled in Outlook. 3) If it is not listed among Disabled Items – please remove the tick from its check box in Outlook COM Add-Ins, click OK, then point back – and put the checkmark, then hit OK. This step runs specific troubleshooting – so please do not ignore it. Hi. Just some feedback and warning to those wishing to upgrade. As a paid user, I had an issue where the Toolkit was not merging to email (from Word 2013 to Outlook 2013). I was using the PDF attachment format. Nothing would happen after pressing OK initially, then an error would pop up stating the toolkit addon is causing problems and may need updating or disabling. After lots of research and trial and error, I decided to update the program. 1. It still didn’t work. A new error arose stating the computer was out of memory. 2. The new version suddenly required me to buy the Pro version to merge to email using the PDF attachment format, something I had been using for the last many years on the older version with no problems. Solution: I uninstalled the new version and reinstalled the older version of the toolkit I thankfully kept and all is now working again. To the developers, I think it is wrong to suddenly make an important feature of the program require payment when a paid licensed user upgrades (especially when upgrading due to a program fault). Dear Alan, thank you for your feedback ! Our support specialists will readily assist you with any issue. I downloaded the trail version but when I try to extract the zip file, it says the folder is empty. and make sure no additional notifications are displayed, after that, please select “Save As” if your browser offers the selection – and specify any local folder to save. If an issue re-occurs – please press Ctrl+F5 on your keyboard to refresh the web page with the cache, and try again. I’m using the Mail Merge Toolkit for multiple years already, but now I am getting an error code and cannot send any emails with it. Can you please take a look at it and let me know how this can be fixed. I’m using the Mail Merge Toolkit for (non-personalised) PDF attachments in Outlook for the first time (Standard version, v3.0), and found that the program (or Outlook?) chokes if I try to do more than 25 emails at a time. Otherwise, it works well, as long as I send in batches of 25. The PDF attachments are ~350kB each, using Outlook 2016, Word 2016, Windows 7. Is there any reason for this limitation, please? Hello Matt, thank you for your question. The limitation of the trial version is 50 messages – and it displays a notification which explains the case. The registered add-in version doesn’t impose any limitation to the number of messages can be created and sent. ‘Mail Merge Toolkit’ generates messages – as many messages as many recipients’ records are there in the selected data base – and places them all into “Outbox”, and here, the operating zone of the add-in is finished, all messages should be sent by Outlook after that. Is it possible that sending numerous messages within a short time interval is limited by your mail server settings ? Please contact your Internet Service Provider (or, network administrator) to elaborate that. I dont know why but my trial version always like this. Please select the “All Records” option during the 6th step of the Mail merge wizard. May i know your software can support add different to the attachment? May i know your software can support add different password to the attachment? Hello Kit, thank you for your question. Mail Merge Toolkit can send your existing password protected files (it will attach them without changes to outgoing messages). But its function does not include adding password protection to the attached files generated by the add-in and attached to the messages base on the Word document (or a publication). 3) If it is not listed among Disabled Items – please remove the tick from its check box in COM Add-Ins, click OK, then point back – and put the checkmark. I can not get mail merge into the list in outlook nor word. What can I do? 1) Close Outlook and Word (all instances) – then, open Task Manager and check that both outlook.exe and winword.exe are not listed under “Processes” tab. If they are – please terminate these processes, or simply log off and log on. 2) Uninstall current version from your computer through the menu “Start-> Settings-> System-> Apps & Features”. Type in the administrator’s password if necessary, and install the software “Only For Me (Current User)” during the third step of Installation Wizard. 6) Launch Word and follow all First Start Wizard’s directions. I have used Mail Merge for a while and I had to purchase a new licence. I have just installed the lastest version and I get this error. No emails are sent towards Outlook also. Hello Alexandre, thank you for your quetsion. 4) the range: From… To… – the add-in will select the records from your data source (recipient list), with the exclusion of those records which are inactive in your list in the 3rd step. So, if you wish to use the add-in filter (From: … To: ….) – please select all your contacts at the 3rd step of your Mail Merge wizard, then specify the range in the very last step, in the add-in settings dialogue. 3) in the Mail Merge Toolkit dialogue window, please make sure “All” records are selected. I downloaded your trail version today and reached the last part of the mail merge process. My problem is that when I press finish, a pop-up window (see sceenshot) opens and says that none of the emails was processed. The emails was not send at all and are not in my outbox either. I am very interested in using your add-in program to send hundreds of mails to clients every month, and I very much hope that you are able to help me solve my problem. Hello Viktor, just for a case: “Processed: 0″ usually means a notification appears underneath other windows and is waiting for your confirmation. For further details (or if it is not the case), please create trouble ticket. Thank you ! I am getting an invalid pointer error… its driving me nuts please help! I´m thinking on downloading Mail Merge Toolkit. I’m planning on sending massive customized invitations to a list of 8,000+ people. So I have two questions. 1. How many emails can I send at the same time. 2. Will the emails become “spam” for the recipient? Sorry if my english is not understandable, let me know. 1. The total number should be virtually unlimited, since there is no intentional limitations in Mail Merge Toolkit once it has been registered. The rest is beyond the add-in’s scope of operation and we cannot predict – for example, there could be a limitation on your mail server/service provider’s side, or even a hard drive free space limitation (the space is required for storing temporary files when merging via the add-in). In any case, we recommend dividing such large mailings into smaller batches. 2. Likewise, Mail Merge Toolkit was not programmed to generate messages appearing as “spam” – if that is what you mean. Hello Ahmed, thank you for your question. You can add multiple attachments to your individual message – please see my screenshot: I added static files, and also selected the data fields from my data source – those fields contain full file name (with the path and file extension) of different files (I created them previously, individually for each my recipient). So my recipients will get both individual attachments and the static files – same for all messages. But in both cases – these files exist now and are saved in their folders. But all other files, previously attached to your message – will be sent as well. I am looking to use this application to send utility invoices to different customers. Please let me know, by using this app can I send different utility bills to different customers. Do I need to attach individual bill with every email or how this app can reduce this manual work???? Hello Awais, thank you for your question. Yes, you can attach individual bill with Mail Merge Toolkit: the feature described here in this article enables a possibility to send individual PDF attachments based on Word document. You can prepare your individual file content in Word, add data fields to your document, then send them to your customers attached as PDF files (or RTF and MHT files as well). Can I have beta version for this app for testing?? I am getting the following error message. If i send the merge as a word document it goes through fine, but the minute that i try convert it to PDF i get the error message. Please try selecting the “All Records” option during the 6th step of the Mail merge wizard. You can still select your recipients during step 5. The issue occurs on certain configurations when both – the native one and the extended (enabled with Mail Merge Toolkit) record filtering methods are used. We recommend only using one of the two. Hello – I am trying to use the mail merge toolkit and am receiving an “Invalid pointer” error. I’m not sure what I’m doing wrong. Can someone please help? I’ve attached a JPG of the error. I’ve successfully tried to enabled it in Word/Outlook 2016, point to File-> Options, highlight Add-Ins in the left block, then locate drop-down options in the bottom and choose “Disabled Items”-> Go. Enable the add-in there, then point to COM Add-Ins and mark. But it still has the same error as the image!What can I try to fix it? Hello Max, thank you for your question. Close Word, Outlook and Publisher and make sure their processes are no longer listed in “Processes” of Task Manager. After downloading the archived installation package, please open that downloaded ZIP-file and extract the proper setup file to a local folder: if you have 32-bit Office edition, please select “Setup for Outlook”, if you have 64-bit Office edition, please select “Setup for Outlook 64-bit”. - keep the “Only for me” selection in the 3rd Installation Wizard step. In the next step, you will be probably offered to enter your Administrator login and password (if required). Hi Olga,thank you for your reply. I’ve tried everything you mentioned,but I still have the same problem,maybe I should try some other add-ins.Don’t worry,I won’t ask for refund,thanks anyway! I have PDF attachments in my signature that stop working/don’t show up when I finish the email merge. How can I get them to work? Hello Nicole, thank you for your question. It depends on which signature you mean. If it is the one stored in Outlook settings (File > Options > Mail > Signatures) – please note that when you edit your documents in Word before merging to email, the signature is not pulled automatically. You may have to include it manually to your document beforehand. Multiple recipients seleceted as per image sent. Also see fields selected in Mail merge toolkit for all 3 recipients selected (Not sure if i did something wrong). But somehow the pdf document was only sent to the first selected recipient from my first image. Could i have done something wrong? Please help. I need this software for my new project. 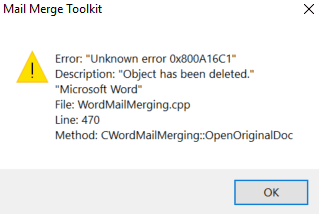 i am not able to locate the option “mail merge toolkit” in MS office 2016, please help. 4) On the resulting window you should see the MMTProg.dll file. Please enable it by highlighting it and clicking the “Enable” button. 7) Locate the add-in in the add-ins list, and put a checkmark beside it to enable it. Click “Ok” and see if the add-in is now present within the interface. 8) If you still do not see the add-in, please try restarting Word after steps 4 and 7 for the changes to apply. If there was no MMTProg.dll file, please remove the checkmark in the 7th step instead, and retry the procedure from the start. I am not able to trace “mail merge toolkit” option after installing. Also went in Add ins options and then “Disabled Items” after clicking on “go” there were no item shown. please suggest I want to purchase this but it not works on trial version that’s why I am not doing payment. Hello Virendra, thank you for your reply. 3) follow the directions – and in the 3rd Installation Wizard step, select (!) “Only for me” – and proceed. In one of the next steps you will be probably offered to enter your Administrator login and password. Hello Gift, thank you for the screenshots. Could you please create a trouble ticket, or send us an e-mail message to support(at)mapilab.com ? This software is exactly what I need. I’m merging from Excel to Word to PDF attachment in an email. I downloaded the trial version, and selected multiple recipients from source excel file. However, only one of the selected recipients seems to receive the email/pdf document (Always the first recipient ticked specifically). Is this perculiar to only the trial version? I want to be sure before actually purchasing the app since i will be using it to send payslips and definitely to multiple recipients at a time. Hello Gift, thank you for your question. The trial version generates 50 message based on the recipient list (if the list contains 50+ TO-recipients) – and correctly reports about this limitation, then sends all generated messages. So, there is no undocumented/unexpected limitations with the trial version. I do not know the details of your mailing – so can merely assume. An issue may occur with the data field selection (so please make sure you selected correct data field in the “To” field of the add-in settings, and that the data field contains e-mail address), or in the mail server level – in this case, you will see all your sent messages in the Sent Items folder, but recipients may find them in Junk Mail, or messages may be even rejected by the server with a NDR (very rare, but this case is known). Sending screen shots of what I had tried to explain. 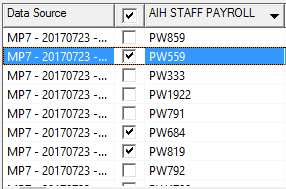 So here i have selected 3 recipients from source excel file to use in testing sending payslips as pdf. Hello Peter, thank you for your quetsion. If you select message format: “RTF Attachment”, your main document is converted to the RTF file, and attached to your message. If you wish your document text to appear in the message body, please select “HTML Filtered” or “Plain Text” as message format. All other selections convert your document to a new file and send that file attached. I tried using the mail merge toolkit. in the last step, I am getting the below error. Please note that mail merge without the toolkit is working fine, however i want to send attachments as well. A similar question has been replied earlier in the comment section. I have the exact problem with the one post this question. I’ve followed the solution and reinstalled 3 times but it never works. I really need to solve this asap, pls help! Dear Melody, thank you for your question. 4) If it is not disabled – please turn it off in COM Add-Ins, then turn on back. I am aslo having this issue. 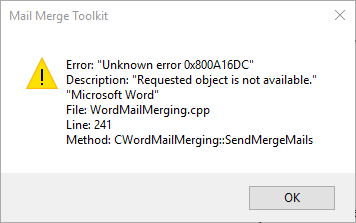 I got “mail merge toolkit not properly installed error” error each time I tried to launch “mail merger toolkit”. I have tried to uninstall/reinstall severally with office applications closed with no success. Am trying to install mail merge toolkit on a team members Laptop. Have ensured that it is for anyone who uses the machine and have gone into Add-Ins for both Word and Outlook and have got ToolKit Enabled. I however, am not able to see the Toolkit when opening Word and going onto Mail Merge Toolkit. Any Tips, please? We will be able to provide you technical assistance afterwards. Thank you for your help but after I tried every of your suggestion, it is still not working. I have attached the screenshot of error here. Please advise. 5) Unzip the package, right-click the setup file relevant to your bit-edition of Office (it could be either 32-bit or 64-bit) – and choose the “Run as Administrator” option. Please type in the administrator’s password, and install the software “For everyone who uses this computer (all users)” during the third step of Installation Wizard. Thank you for your precious advise. Finally, I have done it. Hi, i have the same issue and error. I am asked to reinstall it. I have tried everything you say but it does not work. I have a problem after try to send the E-mail. It always pop up ” Mail merge toolkit is not properly installed. Please reinstall it ” I believe I install the program completely. Please advise. Hello Kenz, thank you for your question. Was it possible that Word, Outlook or Publisher were not closed completely when you previously installed the application ? Before downloading the package, please close Word, Outlook and Published and make sure their processes (winword.exe, outlook.exe, mspub.exe) are no longer listed at “Processes” in Task Manager. Issues with integrating into these basic Office applications are possible if they are running upon installing the add-in. Running with Administrator permissions may also fix installation issues (please note that you may need to select “For everyone who uses this computer (all users)” in the Installation Wizard is you run the setup as Administrator). If the issue reoccurs – please get back to us in our Trouble Ticket system with the screenshot/full text of the error message. This software is exactly what I need. I’m merging from Excel to Word to PDF attachment in an email. I downloaded the trial version. I have a large Excel document with many rows. It is my master records file. I want to merge only 10 items at a time for instance, so far so good, using Send records -> from ___ to ____ . 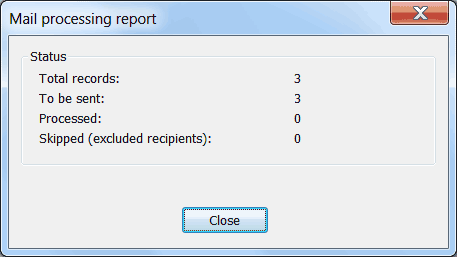 I click OK, However, Word cycles through the whole Excel document before sending the mails, previewing each record, twice! Does it need to do this? Any way I can stop it from doing this? Otherwise it works just as I want it to. Please try switching to the native Word record selection, by clicking the “Edit Recipients List” button (Word ribbon, ‘Mailings’ tab) and choosing the records manually, and leaving the “All Records” option selected in Mail Merge Toolkit. Thank you Ivan, that works. This plug-in looks like it will solve the problem we have, one thing I need to know is language support? We be buying it for three users, one in Japan, one in France and one in the United States. We will be using it to send unique royalty reports to unique email addresses with a standard email. So the final question is this how well can it handle all the different languages that we use? Hello Eric, thank you for your question. The add-in supports working with all languages. But since it uses system components (e.g. while converting Word document to HTML format), the language used in messages should be also selected in the OS Regional settings. Generally, if the regular Microsoft Office Mail Merge feature sends messages OK, our tool should support national characters as well. Program interface provides selection between 3 languages: English, German and Russian. I cannot seem to get the attachments to work. I keep getting the same error message of invalid pointer. Can someone please advise? How do I get the program to let me pick the email account to mail from. Right now it only lets me pick my main account. The add-in is able to use an Account that is present within your Outlook configuration. 2) Click the “Prompt for a profile to be used”. I have scheduled a task in my Outlook 2013 in a laptop. I have made the configuration such that the task runs to send a mail once in a day. Will the task run if my laptop is in shutdown mode? Also, how the concept of the Exchange server actually works? Hello Sakthi, thank you for your question. Mail Merge Toolkit does not support starting mailing by scheduled task. And I believe, the regular Office Mail Merge feature either. If you mean our program MAPILab Toolbox and its components – Email Scheduler or Task Email Scheduler – they can function merely within Outlook, so their functionality depends on your computer settings for Outlook and connection in sleep mode: if your computer is able to wake-up and establish Network connection when Outlook email client is trying to send messages, your scheduled messages will be sent by Outlook. We had a similar issue. Thank you very much for the solution and clear explanation! This was sufficient and worked for my end-user. Serious issue here. Every time I go to mail merge, it prompts me to save the Word doc as a PDF (regardless of the file type I select, i.e. plain text or HTML, Filtered). When I save it, it prompts again. After the second time, it spits an error (see attached). This is Word 2016, I need to get these emails out. Please help. Our app receives this failure report from Word – and we will need more detailed error explanation to troubleshoot. Once the issue is recreated – please switch logging back to None and close Word and Outlook. I have used adobe to attach a PDF mail merged document to e-mail for several years..it is great.. but I want to use a contact group I have created rather than a single e-mail address.. can your product do this? Hello Butch, thank you for your question. Outlook Distribution Groups (if you mean this type of Outlook Contacts items) are unsupported by the Mail Merge feature in Microsoft Office. 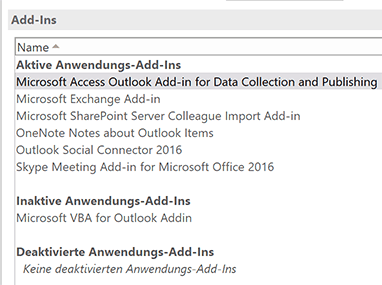 Our add-in is the extension of the regular Office function, and unfortunately, does not support Outlook Distribution Groups either. The mail purpose of Mail Merge and our extension for it is auto generating personal messages based on a single project: your basic document content (or “publication” in Publisher) is converted to individual message body. Our add-in enables conversion of your document content to personal PDF-attachment. But if you wish to send your single message to multiple recipients – both Mail Merge and our add-in support this: e.g. if you use and Excel file as data source, you can add all your recipients to a single cell – and your message will be created for that recipient group. Please note that the lenth of such field is limited by Outlook (256 characters). I want to do a mail merge that uses a standard email message with a pdf attachment of a different file. Your toolkit is turning my email message into an attachment, too, so the email goes out with 2 attachments. This is not my intent. Is it possible to simply add a document attachment to a standard mail merge? I figured it out – no need to reply. Thank you. What was the solution? I am having the same issue. The HTML, Filtered format is recommended when no document conversion during the merge is intended. Just want to thank you for putting the solution for this as I also struggled with the email going with the attachments. How do I attach merged document as pdf and also as plain text on the email body? Thanks! Hello Irene, thank you for your question. 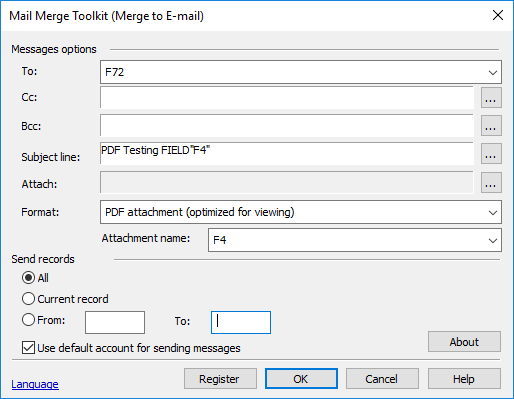 You can select “PDF Attachment” as message format in Mail Merge Toolkit settings – and your document content will be converted to individual PDF files, the add-in will send such pesonal PDF files to each your message recipient attached. Once you select that format and click “OK”, the add-in will offer you to type your message body text – you can use data fields in that form as well. I downloaded the trial toolkit to make sure the product works with what I am looking to do. It attached the files no problem but removed a picture I had as part of the word document. It says “linked image can’t be displayed”. When I mail merge without toolkit and don’t attach a file the picture shows up not problem. Really want to purchase the product but if it solves one problem but creates another I can’t justify. Any help would be appreciated. Hello Paul, thank you for your question. Our add-in converts your document text to HTML (web page) using the regular system converting methods, and images linked to the document may sometimes fail to be added to the message body. To avoid this issue, please embed your image using the regular Word option for inserting, instead of linking. To check how it works with your document, you can imitate the converting procedure: please save your prepared Word document as Web Page, then open that file in your browser. You can also copy the content from the web page – and paste the whole portion back to your Word document (please just care of your data fields in it after that) – with this method, you document will be converted to HTML message 100% the way you expect. I have recently downloaded Mail Merge Toolkit for Windows 10 and it works a treat. However, I was creating a mail merge it for my business which sends highly personal PDF attachments. Does a Mail Merge Toolkit server store the PDF attachments at all? i.e. how safe is the program to use? Does it work just as a script and no database anywhere stores that PDF file to be opened without permission? Hello Sam, thank you for your questions. Our add-in is the extension of the regular Mail Merge feature in Microsoft Office – it just enables additional features for generating and sending messages. All temporary data used to create messages is saved merely at your computer local drive, in your system Temp folders (used for the regular Mail Merge as well) – and is never sent to another location. Once your messages are generated – our program places them to your Outlook Outbox. Here, the operation zone of our tool is completed. All further actions with your messages are performed by Outlook and your mail server – like with your regular messages. So, no database anywhere stores your message data. Our program uses your computer features and local temporary folders to generate messages, then places all generated messages to Outlook Outbos through Outlook Drafts. I need to send emails via mail merge with a PDF attachment, however I need to mail merge some data on the PDF attachment as well. Is this possible with your add-in? Yes, there is a possibility to use Mail Merge with PDF attachments, i.e. attach your merged message as an individual PDF file. I have multiple, individual attachments per email address. If I’m using Excel as my data source, how is this done, i.e. should all attachments be entered into a single cell separated by a space? “Attachment 1″, “Attachment 2″ and “Attachment 3″ data fields can each be inserted in a single mailing. Dear Rachel, thank you for your question ! We will appreciate your feedback and further questions. I experienced an issue testing the Trial Version of Mail Merge Toolkit with Word/ Outlook 2010 on Win10. I sent out emails with a PDF attachment by attaching it in the Mail Merge Toolkit Window. The emails are sent out with attachment and stored in the Sent folder (paperclip icon shows that file is attached). The recipients do receive the email but without the PDF attachment. If I add my own email adress to the recipients, only I get the attachment, not the other recipients. The server is an Exchange Server (Outlook Anywhere). As attaching PDF is crucial for me to use this plugin, I hope for help! Hello Jan, thank you for contacting us. It looks like attachments are delivered merely within your internal network. Is it possible that your Email service provider limits attachments in outgoing mail and cuts them in messages sent outside your network ? Have you ever experienced that with other messages with attachments ? We are ready to start troubleshooting this issue and will do our best to solve it if it depends on our side. thanks for your kind reply! I talked to my Email service provider and they were not aware of any restrictions imposed on their server but nevertheless it might arise from the fact that the Exchange server isn’t as new as another one I tried, which worked. So the issue seems to be limited to certain server configurations. I did not solve the issue using only Mail Merge Toolkit yet but I found a workaround using both Mail Merge Toolkit and Outlook Mail Merge Attachment Tool (OMMA). This might not be the easiest and most clean solution but it works for me: I do the Mail Merge with Mail Merge Toolkit (custom links for every email etc.) and then add the attachment with OMMA vbs-script while the emails are still in Outlook’s “Outgoing” folder. Hello Raju, thank you for your question. Your full file name (with the extension and path) should appear in the Windows Explorer address line regardles of showing or hiding extension settings – please let Windows Explorer display the whole list of your files (like in my screenshot). Please copy that value and test it in Explorer (Win+R, or Start-> Run) – if that works, our add-in will also attach your file. I’m having trouble finding the path to a PDF. I’ve tried using insert hyperlink from my excel spreadsheet but that doesn’t work. When I mail merge it fails. How do I insert (without having to manually type in) the file path? Hello Terry, thank you for your question. then put your mouse cursor to the address line – like in the screenshot. Once you put the cursor to the very end of the path and type the slash, the system will list all available files, with the extensions. Using the arrow keys on your keyboard, you can move between current file selections. Once the file you need is selected and its full name appears in the address line – please highlight the whole string, right-click on it and click “Copy”. If sending a mail merge with PDF attachments on emails, will the Mail Merge Tool kit allow the PDF’s to be ‘named’ based on a field within the document or column from the spreadsheet the merge is looking at? Hello Scott, thank you for your question. Current version can only put the name of the original document/project as the name of your attached PDF files with your personal document content. But we will investigate if such a feature is possible in the future versions, thank you for the suggestion ! And will let you know regarding this feature next week. Our Outlook email has two options (unsecured and secured mailing). Is there a way of opting for the secured, if needed? OR giving the option to send secured or unsecured? Thank you for your question. It looks like that option can be applied to your messages merely within the Outlook email client. Our tool generates new messages, then places them all to Outlook Outbox. If you can configure your tool for sending secured messages to process all outgoing messages (or filtered ones), and if it applies its settings in Outbox, it should also work for the messages generated by Mail Merge Toolkit. Please test. If you experience any issue in the process, please contact us in our trouble ticket system with the details about your system and that software. I tried it. Not sure where the down arrow help button is to enable the logging. It still keeps trying to save the document in Word after I hit ok in the send dialog box and no emails get sent. Thank you for your message. The saving file dialogue is correct – it appears to save your changes in the document. Merely after that, our app gets access to your document and can start generating personal messages for your recipients. 1) Please switch between active windows using the Alt(hold)+Tab(press) keyboard combination, – probably, an active modal dialogue is open, and requires your confirmation. 2) Please check your Drafts folder: if Outlook encounters incorrect data format in the recipients’ fields (To, CC, BCC), it just collects messages in Drafts. If you see there your messages with empty/unresolved recipients’ fields – that is the case. Please try mailing again – but make sure correct data field from your data source is selected in the “To” field of the Mail Merge Toolkit dialogue window. And if that is not the case – please enable detailed logging (switch to “Verbose Info”), like in my screenshot. Once the issue is recreated – please switch logging back to None. I tried all off the steps and things you mentioned in your posts with no luck. if this trial works out we will be able to increase significant productivity. Is there a helpline number I can call to see if this can be fixed? My env. is Office 2016 32 bit, Win 7 64bit. If this works out, I will have at least 10 licence requests to pilot with and may be we can increase it to upto 100 employees. Hello Chris, thank you for your question. We will readily assist you further in our trouble ticket system (mapilab.com/support/) and via e-mail (support (at) mapilab.com). I get through the process in word and when I hit ok it opens up a save box instead of sending. My attachments are working when I have a hyperlink set up for the document but if I try just a simple text of C:\FFF\FFF\FFF.PDF, the add in is not finding the attachment. Any thoughts? Please try to copy that data from the cell to your clipboard – and run it in Windows Explorer (paste into Start-> Run, or press Win+R on the keybpard). Our add-in involves system means to attach files – and if the system command to open that file works, the file should be also attached to your message. Or, you will get a notification stating the file is unavailable. Got it to work. We were missing the extension. I’m unable to attach documents using “Add Data Field” but am able to use “Add File”. My employer will purchase the add but this is a key item on the list. At this point, it has to look at an Excel file with a hyperlink and attach from that point. Maybe using a hyperlink within Excel is not a good use? Hyperlinks from the db fields may be processed incorrectly within the Mail Merge. But if your Excel cell contains full filename (incl.the path and the filename with the file extension) – the add-in should recognize it and attach your file. If that file is for some reason unavailable upon generating message, the add-in will display the notification offering you to select the action for the message with failing attachment: send anyway, skip that message, or stop mailing. Thank you. I will check it out again. I’ve downloaded the Mail merge toolkit on my PC. Here’s what I wish to achieve. I have a word certificate copy (template) with merge fields as Name and email address. I’d like to send the customized PDF copy of this certificate to a list of 700 students. Now in order to first produce the individual certificates, I’m missing the ‘Merge to individual documents’ feature from the Merge tool plugin. Could you please help? And jfac, yes – your scenario is fully supported by our tool. We will appreciate your further questions. 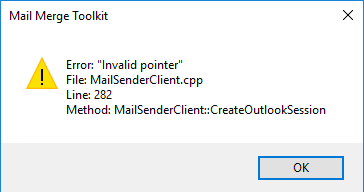 Hi There, I have downloaded the Mailed Merge toolkit for trial and I have tried to email with office staff but there is an error coming up saying Invalid Pointer/ Create Outlook session. Is this error because we haven’t purchase the actual software? I have excel sheet with telephone number in 1st column, email ids in next column, subject in third column, body text in next column followed by path to the file to be attached in the column. My file names are all wild cards so the path would look like : D:\user_profiles\myname\*5065489*.pdf. The paths are derived from the telephone number in the first column. Each user gets only the bill pertaining to his number. Please let me know if mail merge kit would work in this case. But it supports merely static values in the data source – and I am afraid, your dynamic value (if I got your description properly) will not be processed by our tool correctly. Yes, UNC path is supported as well – and you can select your attachments from any folder (local, or Network share) which is available for you at the moment when you start sending your messages. Just had Mail merge toolkit installed and want to know if the attachments can be selected from a Shared network drive, or can it only identify locations on the PC’s C:\ drive? I downloaded the mail merge tool kit. How do I get it to pop up in Word now? 1. After downloading the archived installation package, please open that downloaded ZIP-file and run the proper setup file to start installation (if you have 32-bit Office edition, please select “Setup for Outlook”, if you have 64-bit Office edition, please select “Setup for Outlook 64-bit”). 2. If the add-in is installed – and you got no errors upon the installation – please make sure the add-in is installed for your current user: In Word 2010-16, please go to File-> Options-> Add-Ins and scroll through the list of all your add-ins: if “Mail Merge Toolkit” is not listed there, most probably, you installed it as another user (Administrator) with the setting “Only for me”. Please uninstall the add-in from your machine via Start-> Control Panel-> Programs and Features. If you used to install as Administrator, please select “For enyone who uses this computer (all users)” in the 3rd Installation Wizard step – please see my screenshot. First, please launch Word 2010-16 and open an existing document, or create a new document. With the document open and viewable, find and click File in the top-left portion of the window. Highlight Add-Ins in the left block, then locate drop-down options in the bottom and choose “Disabled Items”-> Go. 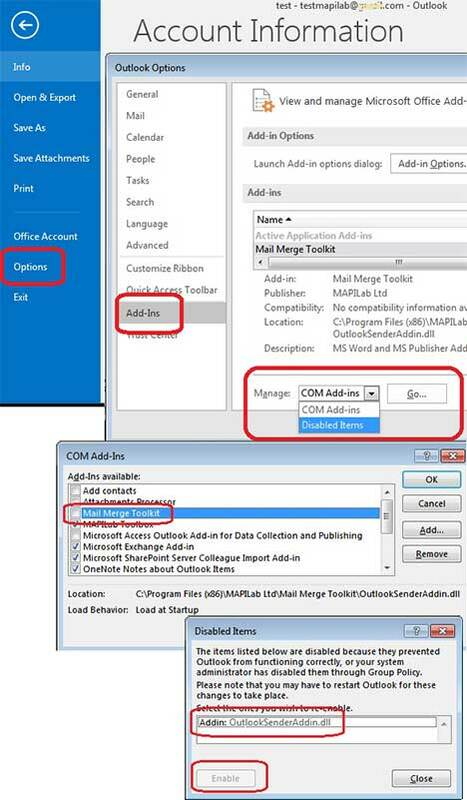 Select and enable the add-in there, then point to COM Add-Ins and put the checkmark to “Mail Merge Toolkit” checkbox. 4. If it is not listed among Disabled Items – please remove the tick from its check box in COM Add-Ins, click OK, then point back – and put the checkmark. After that, either add-in option will be added to the last mail merge wizard step, and to the “Mailings” tab of the ribbon as well, or you will get some informative notification. Please let us know if we can be of any assistance to you. I have the same problem as laura but I am very sure that I have followed the step you mentioned. It is installed for all users in the computer. However it does not exist in the Disabled Items window and COM Add-Ins window. What should I do? Hello Jeffrey, thank you for contacting us. Close Word, Publisher and Outlook and make sure their processes are no longer listed in “Processes” of Task Manager. - extract the proper setup file to a local folder: if you have 32-bit Office edition, please select “Setup for Outlook”, if you have 64-bit Office edition, please select “Setup for Outlook 64-bit”. *- keep the “Only for me” selection in the 3rd Installation Wizard step. In the next step, you will be probably offered to enter your Administrator login and password (if required). Once installation is completed, please start Word, and follow add-in wizard steps. Before running the setup, please close Word, Outlook and Publisher. If it is not listed among Disabled Items – please remove the tick from its check box in COM Add-Ins, click OK, then point back – and put the checkmark. Either add-in option will be added to the last mail merge wizard step and to the ribbon, or you will get some informative notification. The Logging level option is added now for troubleshooting: Mail Merge Toolkit Help button (down-pointing arrow)-> Logging.